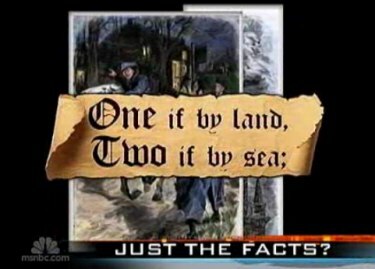 For the third time in as many weeknights, the NBC Nightly News has devoted airtime to the fuss over Sarah Palin’s recounting of Paul Revere’s ride at the onset of the Revolutionary War. This time, the newscast featured a full report by correspondent Lee Cowan showcasing how both Palin supporters and detractors have been attempting to edit the Wikipedia page about Revere. But with Wiki’s Paul Revere page now locked and presumably scrubbed of the unwanted submissions of the Palinites, the account seems to back pretty much everything Palin said. And, throughout all of their coverage, which began Friday night, NBC has — with minor exceptions — carefully avoided saying exactly what Palin has said that is supposedly incorrect. SARAH PALIN: He who warned the British that they weren’t be taking away our arms, by ringing those bells and making sure as he’s riding his horse through town to send those warning shots and bells that we were going to be secure and we were going to be free. 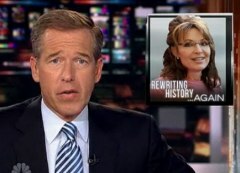 That night, Williams only specifically disputed the reference to bells: “Of course, the real life version involves lanterns.” In the brief item on Monday, Williams simply asserted that Palin’s story “differs with history,” but offered no specific clarification. But the now “locked” Wikipedia site, presumably now cleansed of partisan shenanigans, recounts how Revere was captured by the British and told his captors “that British army troops would be in some danger” (a warning?) and how the “town bell began to clang rapidly” to alert the town — all of which would seem to confirm Palin’s rendition. Revere was captured and questioned by the British soldiers at gunpoint. He told them of the army's movement from Boston, and that British army troops would be in some danger if they approached Lexington, because of the large number of hostile militia gathered there. He and other captives taken by the patrol were still escorted east toward Lexington, until about a half mile from Lexington they heard a gunshot. The British major demanded Revere explain the gunfire, and Revere replied it was a signal to "alarm the country". As the group drew closer to Lexington, the town bell began to clang rapidly, to which one of the captives proclaimed to the British soldiers "The bell's a'ringing! The town's alarmed, and you're all dead men!" The British soldiers gathered and decided not to press further towards Lexington, to instead free the prisoners and to head back to warn their commanders. The correspondent footnote attributes the information to the book Paul Revere's Ride, by historian David Hackett Fischer -- written in 1994, long before Palin’s account became a media controversy. Of course, the main purpose of Revere’s ride (and that of the other patriots that night) was to warn the Americans, not the British. That said, it might be a fairer statement to say that Palin “buried the lead” rather than to flatly state, as Williams did on Monday, that her version “differs from history.” And three consecutive weeknights of coverage seems a lot like overkill for a statement uttered by a non-candidate -- especially since NBC failed to even cover errors from Barack Obama when he was an actual candidate for president four years ago. SARAH PALIN (on Fox News Sunday): Part of his ride was to warn the British that were already there that, hey, you're not going to succeed. You're not going to take American arms. You are not going to beat our own well-armed persons, individual, private militia that we had. He did warn the British and, in a shout-out, gotcha-type of question that was asked of me, I answered candidly, and I know my American history. WILLIAMS: By the way, we checked — the "shout-out, gotcha question" that got her talking about Paul Revere was a reporter asking her, quote, "What have you seen so far today, and what are you going to take away from your visit?" A political web site reported today Palin supporters have attempted to change the story of Revere's ride on Wikipedia to reflect her version of events. LEE COWAN, over the sound of hoofbeats: "One if by land, two if by sea." You know the rest. When Henry Wadsworth Longfellow celebrated Paul Revere's famous ride, few really cared that he took some poetic license. After all, he was more right than most. WOMAN ON THE STREET: Paul Revere and the Raiders? I know that. They're a singing group. Is that close enough? MAN ON THE STREET: That's the guy that was yelling back in the days of World War II. He was like, "the British are coming, the British are coming." Right? COWAN: It's exactly the kind of brain-freeze that Wikipedia can thaw. The online encyclopedia has become the chief arbiter of the water cooler dispute. In the last few days, its Paul Revere page has seen more fighting than Lexington and Concord, all because of someone else's ride through Boston. SARAH PALIN (from last week): You know, he who warned the British that they weren’t be taking away our arms. MICHAEL BESCHLOSS, NBC News historian: If Sarah Palin had it to do all over again, my bet is that she would not say that Paul Revere was out there trying to warn the British. COWAN: Palin's critics quickly raced to Wikipedia, to Wiki-prove that she was wrong. But so did those who thought she was right. Almost instantly, dozens of revisions sprung up on the page, that squared with Palin's account. STEVEN WALLING: Nothing is ever set in stone. We can come back and change and revise things and revisit them as needed. COWAN, to Walling: But only if it's accurate? COWAN: Steven Walling is a Wikipedian, one of the thousands of volunteers who act like online sheriffs, making sure that what's posted on Wikipedia isn't just flat out wrong. WALLING: Actually, the metaphor that a lot of Wikipedians use is more like "janitors." They come and, you know, someone adds something new, and they decide whether it needs to be cleaned up or not. COWAN: Like his silver, Paul Revere's page needed a heavy polishing -- so much so, that the site is now temporarily locked. Unlike beauty, history isn't just in the eye of the beholder -- unless, of course, you're writing poetry. Lee Cowan, NBC News, San Francisco. 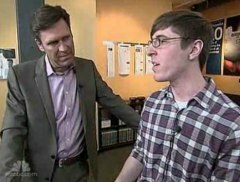 For NBC’s own posted video of Tuesday night’s piece, click here.